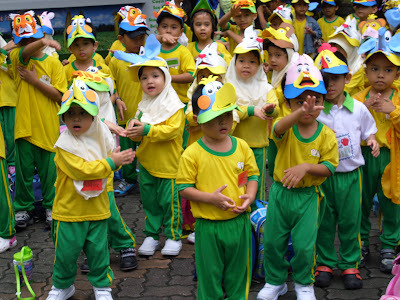 As some of you might already have known, I attend the Children Islamic Centre (CIC) in Kota Damansara. Since I turned 3 this year, I was allowed to attend the 4 and 5 year old classes too and they have so many fun school trips all year round. My head teacher, Teacher Zana allows me to join my seniors in some of the short and interesting trips. So far this year I've gone to 2 school trips. My first trip was to the National Zoo with my seniors from my branch and also other CIC branches around Damansara and Taman Tun. Mommy woke me up really early that morning. I almost fell asleep at the shower! We went to another CIC branch at the The Strand, Kota Damansara at around 8am. Who's more excited? Hehe. With my beloved Teacher Zana. It was raining that morning.. I said goodbye to both Dadda and Mommy before they left. After having breakfast there, we left in a school bus. Teacher Zana took a photo of me with her phone on the bus and sent it to Dadda. When we reached the zoo, the other students from other branches were already there, queuing up. We did a light exercise together and started our mini exploration of the zoo to see some of the animals there. Light exercise? More like chicken dance! Thank god I was wearing a new pair of sports shoes Mommy had bought months earlier. She bought them just because she liked it, not knowing that I would really need them now for this trip. So, thanks Mommy for having this obsession for shoes! I think I was the youngest among all the students there. Yes, you read that right, it Adidas Stan Smith! Thank you Mommy! In the afternoon, we headed back to our respective schools and waited for our parents to come and fetch us. I brought back a bunny hat and some other merchandise from the zoo. It was an exhausting day but I had loads of fun. My second trip was to a hypermarket just nearby our school. 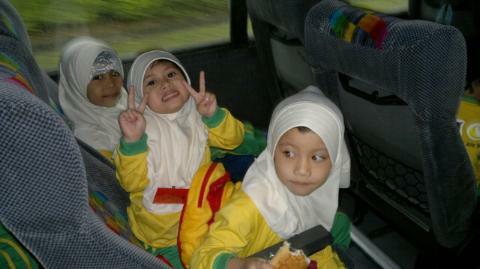 That trip was also for the 4 years and above but Teacher Zana asked Mommy if they could take me along. 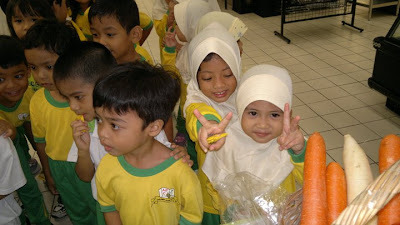 It was during the Health & Science week and we were there to learn about food especially fruits and vegetables. This time, we didn't join other branches as each school went to hypermarkets nearest to them. So, when we went to the Carrefour accross the road from us, others went to other Carrefours or Tescos near them. I learned about the food, names of fruits and vegetables and at the end of the day, we took pictures together and went back to school with some goodies. Our trademark 'PEACE' sign whenever there's a camera in front of us! I'm really looking forward to my school trips in the future. Have a look at the album slideshows below of my CIC trips! CIC the strand ni ok ke? 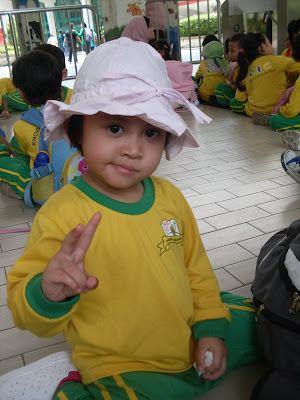 Saya cadang nak hantar anak saya tahun depan..
Risau juga dan pening bila nak pilih school untuk anak saya itu.